This is a long and specialized post, so please feel free to ignore it. I try to write on topics of general interest in these blogs, but I also tend to at times wear different hats, some of them more technical than others. One of these is photography. Of course I post photos I have taken, because they can be fun to look at, but I save the reader from all of the behind-the-scenes goings-on of a more technical nature. No one is really interested, except perhaps the few of you who also enjoy photography techniques. This post is an update from me for you on my photography. Every once in a while I get the itch to share what I am doing photographically as regards technique, in particular when I am going through some kind of transition technically. There is no question that I am moving into the bleeding-edge of digital video, in particular 4K-resolution (four times the size of HD images) and trying to record it, but that is another story. I am also transitioning (or threatening to) with my traditional still photography. That's what I would like to comment on here. I mostly shoot close-ups and macro photographs of nature. I have been photographing nature since 1956 when I was fourteen years old, and intensely studying nature since the age of six. All that is pretty straight-forward. Where it gets more complex is when, without intending to, I began to mix my dharma meditation practice with my photography. I have recounted this story a number of times, so no need to detail it here. You can read about it in the book "Experiences in Mahamudra," which is available as a free digital download here or as a paperback (costs money) on Amazon.com. In my own way I took a page from the Zen Buddhists and could probably write a book called "Zen and the Art of Photography," since I learned Insight Meditation and beginning Mahamudra Meditation through doing photography. In that process, fueled by seeing something about the nature of my own mind while gazing through a camera lens, my photographic technique became increasing involved and somewhat elaborate. I already knew, as all serious photographers do, that any photograph has a single plane of focus and that often the eye is drawn to a particular point of greatest focus in that plane on any given photo, leaving the rest of the photo less in focus or even blurry. The amount of any photo that is focus is determined by the depth-of-field, and most photographers struggle to get more depth-of-field. Depth-of-field is typically controlled by varying the aperture of a lens. If the lens aperture is wide open (wide apertures like f/1.4 and f/2.8), the depth-of-field is very narrow, so only a thin layer of the photo will be in focus. The rest will be blurry. If the lens aperture is very narrow or small (f/11 and f/f16), the depth of field will be deeper and much more of the entire photo will be in focus. In this case the camera becomes like one of those old pinhole cameras. But there is a problem. It is called "diffraction," and it is a simple law of nature, much like gravity. There is no getting around it. When the lens aperture gets very narrow, the light has to squeeze through a tiny hole and it actually bends as it shines through. This bending causes the final image on the camera sensor to degrade and soften, actually making the image less sharp. So the photographer is caught between the devil and the deep blue sea as they say. If we open the lens aperture very wide, there is little depth-of-field. If we narrow it down we get greater depth-of-field up to the point where diffraction kicks in, after which the image softens dramatically. Photographers have tried (ever since the camera was invented) to get around the law of diffraction, but with little success. As mentioned, diffraction is a law of nature, pure physics, which brings me to my own involvement with this issue. Years ago, as I gazed, day after day, through ever sharper lenses at flowers, critters, and tiny worlds, I wanted to not only see more of what I was photographing (greater depth-of-field), but I also wanted to see ever more clearly (what is called 'sharpness'). What we call "sharpness" is a combination of camera resolution and acutance. Resolution is too complex to go into here, but it is typically expressed by the number of pixels involved. For example, my Nikon D800E is a 36 MP camera. Acutance has to do with how the edge contrast within an image is handled. While resolution captured in a photo is fixed, acutance can be variable and manipulated in post-processing, after the photo is taken. High acutance can also be baked into a highly-corrected lens. To make a long story even longer, in my mixing of photography with mind training, I pushed my lens apertures as far as I could, but eventually ran out of improved results. I wanted to see deeper (depth-of-field) and sharper (which for me turned on acutance). How to do this? To get (at least the appearance) of greater depth-of-field I began to learn to stack focus. Focus stacking is very simple, but also very tedious. Instead of a single photo, we take a series of focused photos, layers actually, starting at the very front of our subject and moving gradually to the rear of the subject. We end up with a series of focused layers, from front to back, each layer clearly focusing on one section or slice of the subject. Then, using software, we combine these layers (which can be in the hundreds! ), taking the sharpness of each successive layer, to build a single image where the entire subject appears in perfect focus -- a stacked photo. So I wandered into the world of focus stacking, which involved taking ever more photos to obtain a single resulting photograph. And this took much more time, of course, than a single photo, which meant my subject could not move even a tiny bit or that movement would disturb the final image. Since at the same time I was stacking focus, I was practicing Insight Meditation, I actually enjoyed the elaborate procedure involved in stacking focus. It made my mind clearer and clearer as I proceeded, but that clarity was also tied to photography. In other words, if I wanted a clear head I had to go out and photograph nature, etc. As mentioned, that is another story. I also found that sheer sharpness (resolution) by itself was not satisfying. Yes, my photographs were sharper, but they also became increasingly "contrasty," if that is a word. They became caricatures of themselves, so to speak. In fact, most of my "sharpest" lenses exhibited this quality. They were indeed 'sharp', but increasing less natural than what I saw with my eyes. And for me, photography is entirely impressionistic. I wish to capture in a photograph what my mind sees through my eyes -- that kind of thing. So I banged my head up a dead alley for a while until I noticed something. There were lenses, very few in fact, that were somehow softer and more natural than others, and I began to collect them. These were what are called APO lenses, apochromatic. In a nutshell, APO lenses are simply lenses that are more highly corrected than others. In particular their acutance (edge handling) is improved. Various kinds of aberrations present in most lenses are corrected until the aberrations are removed. But this process of refining used in APO lenses is very expensive. Yet in APO lenses I began to find what I always had looked for, sharpness that was also soft and natural in nature, basically an oxymoron. By this time I had a collection of some of the finest lenses made for DSLR cameras in the world. Once I saw the beauty of APO lenses, most of my lens collection was left on the shelf. I never used them again. Instead I used APO macro lenses like the Coastal Optics 60mm f/4 APO, the Leica 100mm f/2 APO Elmarit-R, and the Voigtlander 125mm f/2.5 APO-Lanthar, especially the Voigtlander which, for me, was the best all-around APO macro lens I owned. And with these APO lenses, I stacked focus, hundreds of thousands of images, and then some. And in my search for the best APO lenses, I wandered into the realm of industrial lenses, very expensive lenses that are very highly corrected, like lenses used to do cinematic film transfers. Some of these lenses (Printing Nikkors) originally cost $12,000 or more, but as film gave way to digital delivery, these lenses would come on the market for perhaps several thousand dollars. They are pristine. And I got into enlarger lenses like the El-Nikkor 105mm APO lens. The long and the short of it is that once again I found that APO lenses gave me the results I had been looking for, although some of these industrials lacked the modern coatings we find in more modern lenses. I also found industrial lenses that had not been highly corrected, and could immediately tell the difference. And my focus-stacking technique changed. Instead of pushing to smaller apertures, I sought out lenses that were fast and sharp wide open, which meant that anything not in focus had dreamy bokeh -- out-of-focus areas. Then, using wide apertures (very narrow depth-of-field), like a laser, I would paint in detail by stacking focus, leaving the remainder of the photo an impressionistic blur. I liked the results. In the fall of 2012, Carl Zeiss introduced the APO Sonnar T* 135mm F2 telephoto lens, followed about a year later with the Zeiss Otus 55mm f/1.4 APO Distagon T* ZF.2, both available in the Nikon mount. Since these lenses are not close-up or macro lenses, I dilly-dallied around for quite a while trying to ignore them. But careful reading of reviews and hands-on reports eventually found me buying both lenses. And I have not been the same since. I was no stranger to Zeiss lenses. I owned the 50mm and 100mm Zeiss Makro-Planar (and others), but always found them not corrected well enough for my work. In other words, they were not APO, and so I was not much impressed with Zeiss lenses except for their build. These two new Zeiss lenses (135mm and 55mm APO) are more highly corrected (IMO) than any of the many great lenses I own. In fact, there is no point in using most of the lenses in my collection any longer and I have begun to sell them off. They don't hold a candle to the two new Zeiss. And now that spring has been coming after a brutal winter, I am out in the woods comparing stacking focus with the new Zeiss lenses and just taking traditional single photos. I find that with these new Zeiss lenses I can push the aperture very high, all the way to f/16 and still not be bothered much by diffraction. What this does is make it less and less useful to stack focus. What's the point? 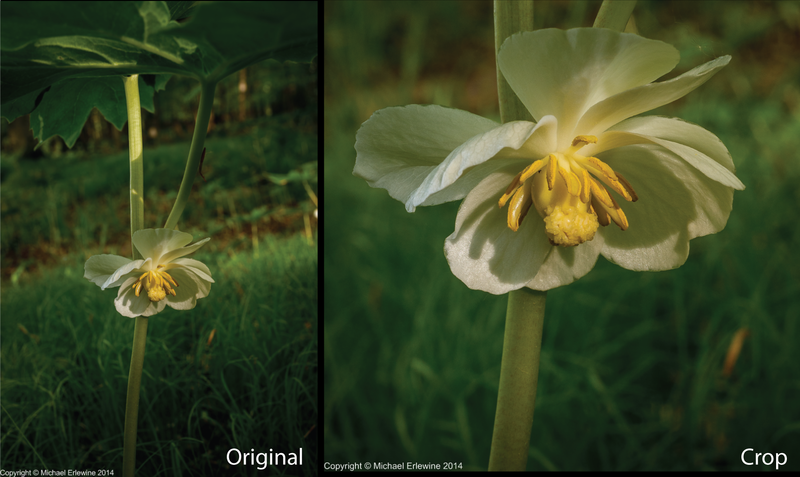 Focus stacking by definition introduces unwanted artifacts into the finished photo which require (at times) extensive retouching to remove. I have had to reevaluate what my photographic intentions are beyond technique-for-techniques-sake. And I find that my original goal is still intact, representing my mental and visual impressions thought photography. Focus stacking was just a means to do that. It kind of scares the bejesus out of me to consider bypassing stacking focus and all my years to master it, but increasingly I find I am doing just that. Here is a single-shot photo (drastically reduced) taken yesterday of a May Apple flower, including a closer crop of the flower itself. Yes, I could perhaps produce a sharper image of the flower by stacking it, but at the expense of messing with the color (which stacking cannot help but do), but why bother. And did I mention that a wind was blowing most of the time when I took this photo. These new lenses from Zeiss make stacking unnecessary. I wonder what other focus-stacking photographers using the Zeiss for close-up are finding out? Let me know.